Home » Step Through Insert – What is it? Step Through Insert – What is it? A step through insert is a beautiful product available to seamlessly and inexpensively work safety into your existing bathroom. 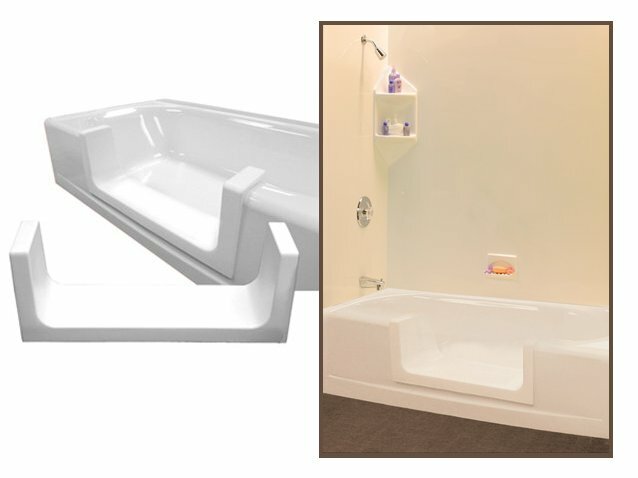 Our step through insert is the finishing touch for the tub to shower conversion which creates easy step through access. It is a cap that sits like a saddle over the portion of the tub cut out to create the walk through access. It also provides a safety step that allows the individual a lower barrier access to the tub without having to lift their legs over the standard tub rail. Typically homes have bathtubs instead of showers. However, there simply seems to be more of a need in most homes these days for easily accessible showers instead. 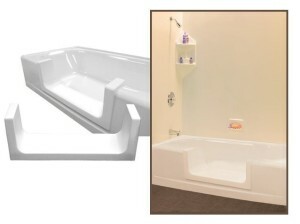 By turning the tub into a shower utilizing our walk through insert; it can greatly reduce the possibility of falls for anyone who currently experiences difficulty when getting in and out of the tub. Though essentially the same procedure; several other common terms describe the step through insert process. Some of the most popular are tub to shower conversion, create handicap accessible tubs, safety step conversion, walk in tub conversions and step through access. Whatever you call the process, however, it isn’t complete without capping it off with our step through insert! The step through insert is a low cost alternative to complete bathroom remodeling. It can save you thousands of dollars compared to typical bath remodeling or the cost to put in a walk-in tub. Customers can install the insert in fiberglass, steel or even cast iron tubs. Our step through product is a fairly easy do-it-yourself kit for re-modelers or homeowners with some home repair experience. Though the kit includes the step and adhesive necessary for installation; several tools and additional equipment will be required to complete the installation procedure. Either purchase your product online or call us to place an order.